Drawing was a very important element in Aztec culture and also part of the Aztec education of young people. This was because the Aztecs did not have a written script for their language and had to resort to drawings for the transmission and dissemination of knowledge and information. A variety of Aztec codices are available with different kinds of Aztec drawings dealing with almost all the aspects of Aztec life. For instance, there are Aztec drawings that depict historical events and drawings about their religious ceremonies and festivals. These Aztec drawings are a rich source of information about Aztec life and culture. After the Spanish conquest of the Aztec Empire, a lot of these drawings were compiled in book form accompanied with writings since the Spaniards introduced Latin script in the Nahuatl language which enormously enhanced its power. 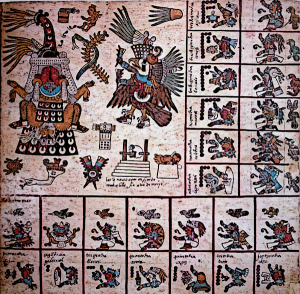 Other than the recording of events, religious concepts, and other details, Aztec drawing was also used in counting. For the counting of small numbers, use of dots was sufficient. This was sufficient for the Aztec calendar where no number greater than 20 was required since there were only 20 days in Aztec month and a total of 18 months. However, for the depiction of numbers greater than 20, various kinds of Aztec drawings were used. For instance, the figure 20 was represented by a flag, figure 400 was represented with a feather, the figure 8000 was represented with a bag of incense, and so on. A conjunction of these Aztec drawings could be used to represent a bigger quantity. For instance, the number 500 could be represented with a feather for 400 and five flags for 100 (5×20). In order to show that multiple drawings of glyphs belonged in the same group or was a single number, a line was drawn to connect these drawings or glyphs. A common form of Aztec drawings was pictorial logograms which were used for writing down names of people and places in addition to recording historical events. A lot of these logograms have been recorded in the Aztec codices most of which were compiled after the Spanish conquest of the Aztec Empire. One popular example is the representation of a conquered city in the form of a logogram. In this Aztec drawing, the conquered city is represented with a pyramid whose top has been destroyed and smoke is rising from it. To further make the concept clear, an Aztec warrior is shown capturing the soldier of the conquered city. Special techniques were used for Aztec drawings or logograms in order to represent the names of people and places. Highly pictorial logograms were grouped together to signify the names because compound words and long phrases in Aztec language were formed from roots and affixes. Thus a group of Aztec drawings was used to represent a compound word or phrase. For instance, the world Chilapan means “above the river of Chiles” and is represented by two glyphs or drawings. One glyph is the red chili pepper which signified the logogram “Chile” while the other glyph is the cross-section of a river which represents the logogram for “Apan” meaning river. Similarly, the phrase “place of five flowers” consists of root words “macuil-li” represented by five dots and “xochi-tl” represented by a flower. The suffix used for place is –c which was usually omitted and taken implicit by the Aztec scribes. This system was fairly complex but in the absence of a written script, it served well for preservation and transmission of knowledge. Another important concept in Aztec drawings was rebus writing which was used when it became difficult to visually depict a concept graphically. In such a case, a logogram was utilized for its phonetic value instead of its meaning. The phonetic value represented another root or suffix that was similar to the logogram. As an example, the world coatzinco means “place of little snakes”. To represent this concept, two logograms of “koa” and “tzin” are used. “koa” means snake while “tzin”, on the other hand, means “buttocks” which is clearly not the literal meaning. So in this case, “tzin” is used because the root from tzin is homophonous with the suffix –tzin which is synonymous to “little”, thus completing the meaning of the phrase. The suffix –co meaning “place of” is omitted and is taken as understood. 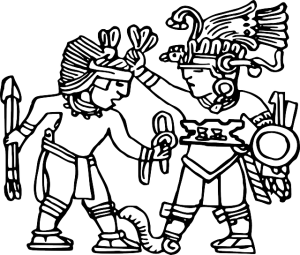 Thus, the Aztec drawing showing a snake on the top of the lower half of human body represents the phrase “place of little snakes” in the Aztec language. One of the most important aspects of Aztec drawing was the warrior drawings and drawings about battles. Most of the information about the Aztec battles and conquests in the pre-Columbian era comes from these drawings. A lot of Aztec drawings about warriors depict warriors in different costumes. For instance, the Eagle Warriors are shown wearing their particular form of costume and similarly the Jaguar Warriors with the jaguar costume. The uniform of these warriors often represented the particular group of warriors which they belonged to in addition to their position in the military hierarchy. Warriors of higher rank generally wore more elaborate costumes. 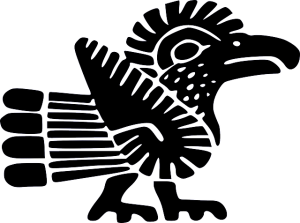 Aztec drawings also provide information about the general gear of the warriors and the kind of equipment that they used. Aztec religious drawings are of diverse variety since religion was of supreme importance in the Aztec Empire. A lot of drawings show priests during the religious ceremonies and festivals, performing the rituals and wearing a costume which made them look like gods. Similarly, a variety of Aztec drawings depict Aztec gods in the form of various animals which were associated with those gods and the kind of powers they had. The Aztec language did not have a written script and in the absence of this feature, they resorted to drawings in the form of logograms and pictograms to preserve and transmit knowledge. This system of Aztec drawings was fairly complex since even simple concepts required drawing, but it did well to preserve and disseminate the knowledge. A variety of Aztec drawings give rich information about their customs and traditions, their history, their warfare, and religion etc.